Details relating to the Estonian Commemorative of 2018. 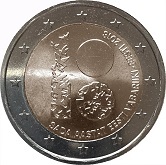 The coin commemorates the 100th anniversary of the independence of Estonia. The design is ingenious. On the left is a column and on the right two circles, one above the other, which can be seen separately, when together with the column, we see 100 or they can be seen as the top and bottom of an eight in which case we read 18. The column and the lower circle are composed of the silhouettes of flying pigeons. Thus are represented the year of attaining independence (19)18 and the 100 years of independence. This is the official logo of the centenary celebrations. Around the edge of the inner circle, running anti-clockwise from seven to one o’clock is the inscription: “SADA AASTAT EESTI VABARIIKI EESTI 2018” (One hundred Years Republic of Estonia Estonia 2018). Return from EU Commemorative 2007 to euro coin collector.